Welcome to Marwood Cooperatives website! Here you can find information about Marwood house, and alumni of Marwood can create accounts and update contact information. As you can see the house website has been reconstructed. Along with looking different there are some new features of the website. The main feature of this website is the ability for you, an alumni of the great Marwood Cooperative, to create an account with us. Once you have an account set up, you will be able to store contact information, such as current address, email or phone numbers. ( this information will only be available to members of the same pledge class, and the website administrator ) This will greatly improve our Alumni Database allowing us to keep you up to date with house matters. In the fall of the year nineteen hundred and thirty-six, Reverend William McFadden, of the Methodist Church of West Lafayette, held a meeting at the Wesley Foundation. This meeting was held to discuss plans for securing a suitable house for starting a Cooperative House. After a house was found at 204 Marstellar Street, fifteen Purdue students organized and moved into the house on or soon after January 1, 1937, and they named the house Marstellar Cooperative House, and paid a $20.00 monthly house bill. Marstellar Cooperative became known as Marwood Cooperative House when it was decided to combine the names of the streets the house was on, the corner of Marstellar and Wood Streets. Bachelor Haven, on the corner of Waldron and State Streets, became the second house occupied by the Marwood members on June 2, 1942. Mr. Goodnight, the landlord of Bachelor Haven, rented the house to the Marwood members for $50.00 a month. In 1946, plans were completed to pay off the mortgage of the house. In 1955, the house was officially purchased and owned by the Marwood members. In the fall of 1967, Marwood Cooperative moved to a new location at 136 Littleton Street. The purchasing price, consisting of the house (owned by Dr. Calvert) and three acres, was $85,0000.00. the house was previously occupied by a Jewish fraternity, Tau Epsilon Phi. In 1978, the mortgage was paid off on this house, and, once again, Marwood owned its own house. Mrs. Ryan retired after the Spring semester of 1985. In the search of a new cook, a member of the house, Mr. Timothy Ehlerding, proposed to act as cook in exchange for free room and board, and the members accepted. To avoid having to fill the cook position so often, it was decided to hire someone other than a house member as cook. Mrs. Edith Crandall was hired in the fall of 1986. Then , in October of 1990, Mrs. Crandall retired, due to her husband’s declining health. The house members accepted the quick solution of having two house members, Mike Albrecht and Brent Spaulding, alternate cooking responsibilities. Following this, Marwood members took over the responsibility of all food preparation. In the fall of 1995, Marwood Cooperative became known as Theta Delta Chi. In order to ease growing financial burdens, the House hoped to benefit from belonging to a national chartered fraternity. After one year and no real foreseeable benefit, the House returned to being known only as Marwood and rejoined the Purdue Cooperative Council. This movement is why Marwood is no longer the longest running Cooperative House but is still the oldest. 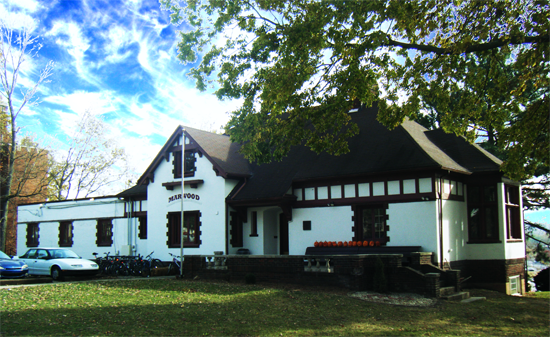 Marwood Cooperative House, being the oldest cooperative dating back to 1936, offers a care-free and close-knit environment where young men can learn essential skills that will help them later on in life. Marwood is conveniently located next to the Levee and is a short walk from campus. Because of its relatively small number of members, Marwood offers an opportunity to make friends that will indeed last a lifetime. The best thing about Marwood is that there is always something to do. Marwood, to this day, prides itself on its unique diversity, efficiency, and self-sufficiency. The house and the property it stands on are jointly owned, not by the university, but by each member of Marwood, both active members and alumni. By living at Marwood, we are perpetuating the life of an organization that we can honestly call our own. The members of Marwood are enrolled in a variety of different majors; you can always find someone to help answer a question. At Marwood we stress the importance of academics and all members are strongly encouraged to apply themselves to the best of their abilities. Got all of your homework done? Just walk down the hall and see who is hanging out or playing games in the front yard. We participate in a variety of intramural sports against other cooperative houses. Feel like relaxing somewhere besides campus? The men of Marwood often pack up for a weekend of camping, paintball, or both. On Friday night, Marwood Cooperative activated 7 new members after they completed the new member process. These members include, Gaige Lucas, Carter Stephenson, Aaron Stevenson, Roman Dziennik, Daric Gordon, Jacob Minnette, and Cole Pearson. Congratulations to our new Actives! House elections will be held for all positions tonight at the house meeting starting at 7 pm.